Weincek, Henry. 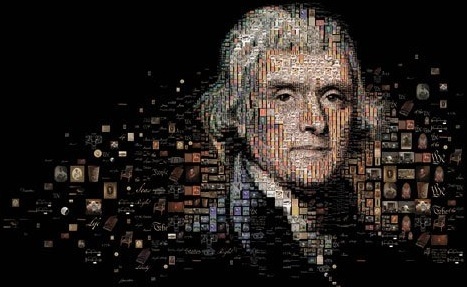 “The Dark Side of Thomas Jefferson.” Smithsonian Magazine. October 2012. “I never considered a difference of opinion in politics, in religion, in philosophy, as cause for withdrawing from a friend,” Thomas Jefferson is said to have pronounced. This quotation has been widely circulated online this election season where some of us try never to reveal our opinions while others of us try futilely to change the minds of our friends who disagree with us. Neither of these extremes seems to work very well. I really want a world where we can talk about our religion and politics and philosophy and learn from one another–a world where we find a third way–a middle place where we honor what’s best in the opposition and put it to work in a world much in need of compromise and collaboration. I like to think that I try to do that most of the time. But my daughter is quick to disabuse me of that notion and to remind me that while I listen to what people say, I still try to convince them that I’m right. So how do we hold on to our best principles and yet hear that the opposition also has some best principles? What’s the difference between learning from one another and letting go of what we believe is right? This isn’t a new question in a country that is founded on democracy–a philosophy that is often hard to live by as it’s played out in the real world. As Henry Weincek’s fascinating article in Smithsonian Magazine points out, Thomas Jefferson–the man we hold up as the standard bearer for freedom and democracy–somewhere along the way gave up his principles. In his original draft of the Declaration of Independence, he denounced slavery as “a cruel war against human nature itself, violating its most sacred rights of life & liberties.” But South Carolina and Georgia refused to sign such a document, so it was revised. And as we know now, by 1790 Jefferson had given up his efforts entirely and not only owned slaves but tolerated brutality against them. Had Jefferson lived by his principles instead of giving them up, how different might our nation have been? Would we be living a very different legacy of race in this country? Or would we even have continued to be the “United” States of America? And so it is that we allow ourselves to expect more of our leaders than we are sometimes capable of ourselves. We want to keep our friends. We can’t figure out how to hear each other, so we keep silent, speak so loudly that our friends walk away and ignore us until the battle of the political season is over, or give up on what we truly believe. We want our leaders to have principles and live by them. We want our leaders to compromise and collaborate. How can they possibly do both? One thing is certain, no matter who wins the election today: our President has a monumental task before him. Find a way to hold on to your principles, find a way to hear what’s best in your opponents’ principles, find a third way that is better than either way alone. And so, Mr. President, whoever you are at the end of this day, my friend, I pray that you’ll find a way to do better what we’ve been trying so valiantly to do for over 200 years. Previous PostWhat Is a Saint?Next PostWhat Is a Great Teacher?